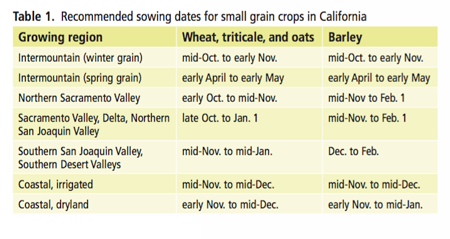 Most of California’s small grain crop is sown in the fall (October through December) (see table 1) and harvested in late spring to early summer (May through July). One excep- tion is in the Intermountain Region of Northern California, where both winter and spring cereals are produced. True winter cereals are seeded in this area in mid-October through November and harvested in July. Spring cereals are sown in the spring (early April to mid-May) and harvested in late summer (late August through mid-September). Choosing the correct sowing date can reduce the likelihood of damage by frost and certain diseases, make weeds easier to control, and increase yield. Sowing too early in the fall increases the risk of frost injury at flowering, damage by barley yellow dwarf virus (wheat, bar- ley, oat), Septoria tritici leaf blotch (wheat), and net blotch and leaf scald (barley). Later-emerging crops are less likely to be damaged by frosts; the crop should be sown late enough to minimize the risk that the crop will be flowering when there is a significant chance of frost. grain produces fewer tillers and shorter plants; it is also likely to be damaged by barley yellow dwarf virus. In rainfed systems where growers must make maximum use of win- ter rainfall, sowing usually starts in mid to late October, early enough so that sowing can be finished before winter rains saturate the soil and prevent operation of equipment. Replanting is necessary if stand establishment is poor. A good plant density for an irrigated field averages about 25 plants per square foot (270 per square meter). Consider replanting if the stand is less than half of that density.